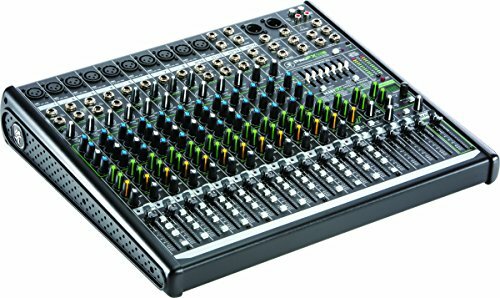 What Is the Mackie PROFX16V2? Conclusion – Is the Mackie PROFX16V2 Something to Consider? Founded in 1988, Mackie has been focused on producing affordable compact mixers that are designed for musicians of all abilities and budgets. They are known not only for pushing themselves to release better equipment each time they manufacture something new, but also for understanding what musicians want from their equipment and then working hard to provide it. All of their mixers are held to very high standards, and the PROFX16V2 is no exception. There are six mixers in this series, and they are all designed with Vita preamps, a ReadyFX effects engine, great audio toolkit, and USB playback and recording. The Mackie PROFX16V2 is a 16-channel, 4-bus effects mixer that has USB connectivity. It is a professional effects mixer that allows you to enjoy an affordable piece of equipment without lower sound quality. This mixer is designed for the musician who performs live and wants a powerful and compact mixer to take on the road. It’s designed to withstand life on the road without any damage, thanks to the durable and strong chassis. While created with live sound in mind, it can work well in the studio and for recording, but musicians aren’t going to be able to enjoy the raw power that it offers if they don’t ever use it on stage. 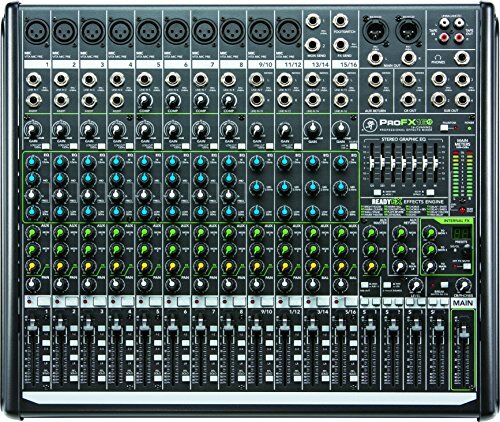 The Mackie PROFX16V2 is a little more expensive than some other compact mixers on the market, but it is still affordable for most musicians. Beginners may not have the money for the mixer, but intermediate and advanced musicians will likely be able to make this investment. Professionals may pass on the Mackie PROFX16V2 in lieu of something with a little more power. Even podcasters who are looking to record their voice and add effects for their podcast can benefit from the Mackie PROFX16V2. This powerful piece of equipment is great for more advanced podcasters who have a little more experience and are looking for a more reliable option than their current setup. The Mackie PROFX16V2 ships by itself, which is common for compact mixers such as this one. This does mean, however, that you need to make sure that you have your instruments, cables, and computer on hand so that you can set it up and start mixing and recording right away. The included Tracktion music software is easy to install on either a PC or a Mac and is powerful enough for musicians to easily record and mix their sound on the go. It’s simple to archive your recordings for use at a later time. The 16 line inputs make it easy to connect samplers, keyboards, and any other gear that you have with you. This means that the Mackie PROFX16V2 is powerful enough to stand up to use by multiple musicians without slowing down or resulting in lower sound quality. Additionally, the effects engine has 16 different effects for musicians to choose from. These include choruses, reverbs, and delays. The seven-band EQ makes it easy to control both mains and monitors. The Mackie PROFX16V2 is an audio toolkit that is incredibly well stocked and shockingly powerful due to its smaller size. It features not only tools such as multi-band graphic equalization, but also beneficial smart features such as the channel inserts. With so many tools to choose from, musicians can easily customize their sound. One feature that all musicians love about the Mackie PROFX16V2 is that is has a built-in interface. This interface makes it easy to record your music or mix it to be played back during a live show. While the Mackie PROFX16V2 is designed to not only be powerful but also incredibly affordable, it may be a little too expensive for some beginning musicians. If that is the case, then you will want to consider the Behringer Xenyx X1222USB as an alternative. It features 16 editable presets, four mic preamps, four compressors, and three-band EQ, but is a little more affordable. While it won’t offer all of the control of the Mackie PROFX16V2, it’s a great option for musicians who have a tighter budget. Another wonderful alternative is the Mackie 1604VLZ4. 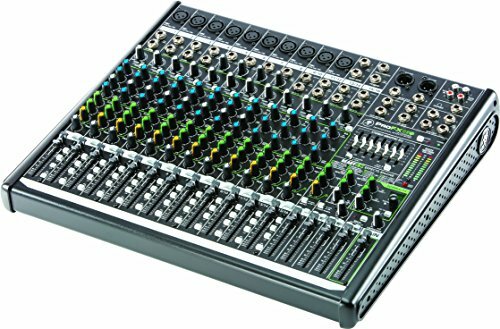 This 16-channel mixer is compact but offers an ultra-wide gain range of 60 dB. Additionally, it has an extended frequency response and great line input handling. It is more expensive than the PROFX16V2, but musicians who are looking for more power from their mixer will want to give it a chance. The Mackie PROFX16V2 is surprisingly powerful given how small and compact it is, making it a great choice for any musician or podcaster who wants to be able to record, edit, and mix their sound. While it can be used in a studio location, it really shines when used for live performances, and more advanced musicians will be able to make the most out of this equipment. If you perform live on a regular basis and are interested in a mixer that is compact and durable enough to go with you on the road from gig to gig but will still offer you all of the recording and mixing abilities that you crave, then the Mackie PROFX16V2 may be right for you. It’s designed to be intuitive and easy to use, and once you understand all of the controls and components, it’s a great piece of equipment that is sure to make you sound your best.